The Living Wage Campaign in Brighton and Hove has won funding for an extra year after signing up more than 120 employers in its first two years. The campaign is being run by the Brighton and Hove Chamber of Commerce which has urged businesses to pay staff at least £7.65 an hour. This has been calculated as the minimum hourly rate needed to live in Brighton and Hove. 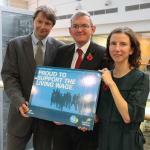 The chamber said: “Brighton Chamber has been running the Living Wage Campaign in the city for the last two years. But the chamber said: “So far 123 businesses and organisations have signed up to pay their staff a minimum of £7.65. “Over 1,800 salaries have been raised as a result. “Paying the Living Wage is voluntary, which is why the businesses that have signed up are to be applauded. Most of the people they care for have mental health difficulties, learning disabilities or are recently discharged from hospital. Chief executive Craig Jones said: “At Brighton and Sussex Care we recognise that paying people fairly isn’t just an option, it’s something we must do. “We want to recruit and retain the best team in the field because that will help our service users reach their full potential. “People work better when they feel valued by a fair employer. “In an increasingly competitive environment we need our teams to deliver the highest standards of care and one way in which we achieve that is by ensuring that we pay our staff fairly from the moment they arrive at work until the moment that they leave. “It’s simply not fair to expect people to meet the enabling costs of employment. “Quite simply, the living wage makes good business sense. “All care work is extremely hard as it can be emotionally, physically and mentally demanding. “Carers need time and patience but it is a sad reality that it is an extremely low paid sector. “Some question how we will ever get good quality care for our loved ones on the back of such poor pay structures. “Some care workers are reported to earn less than the minimum wage and most receive no pay for travel or allowances between home visits. “Brighton and Sussex Care is a business with a purpose and a conscience and is proud to have been awarded national and regional finalist in the Great British Care Awards 2013 and a finalist in both the National Learning Disability Awards and Health Investor Awards 2014. “There is a huge pressure to reduce costs in adult social care and some companies try to address this by reducing their highest cost, which is the salaries of their main asset. “The consequence of this can be that ultimately poor pay can result in service users experiencing levels of support which are below standard. “Staff retention is poor and hiring and training costs go up and savings are made in the wrong areas. “Our mission at Brighton and Sussex Care is to employ people on a Living Wage and upwards so that we recruit and retain our staff ensuring consistency and quality service. In just four years the company has become one of Kemp Town’s biggest employers. Mr Jones said: “We invest in our people as they are our greatest asset. Retention is everything here and putting our people first works. “When people are paid and managed well they are loyal, do a great job, enjoy coming to work and sickness levels are low. “We have a very good sickness record because we address any support issues straight away. “Caring is a very stressful job and we ensure our staff know that we take this into consideration and always have support when they need it. “At Brighton and Sussex Care we need to deliver the right support at the right time, first time and every time and that can only be achieved by paying people what they are worth, and making them feel valued within the structure they are in. For more information visit www.livingwagebrighton.co.uk.